Make the dough. In a medium-sized mixing bowl, combine the 2 cups flour and 1 ½ teaspoons salt until combined. Make a well in the center of the mixture, adding the 1/3 cup soy yogurt, 2 tablespoons soy milk, and the egg. With a wooden spoon, pull the flour from the edges of the bowl into the center until forming a soft dough. On a lightly floured countertop or work surface, turn the dough out and knead until elastic, about 5 minutes. Wrap in plastic wrap and allow to rest for at least 30 minutes. Make the filling. In a medium-sized stockpot or saucepan, boil enough water to cover the potatoes. Boil until tender, about 20 minutes. Drain in a colander and set aside. Meanwhile, heat the 1 tablespoon olive oil in a heavy-bottomed skillet over medium heat, adding the onions and garlic once hot. Stirring occasionally, saute until the onions are translucent and fragrant, about 7 to 10 minutes. Remove from heat and set aside. Place the potatoes, onion and garlic mixture and 1 cup soy yogurt in a food processor, pulsing several times so that the mixture is creamy but not pureed. Salt and pepper to taste. Make the pierogi. Boil several cups of salted water. On a lightly floured surface, divide the dough into four sections and working with one section at a time, roll out the dough until very thin, about 1/8" thick or thinner. Using a round pastry cutter, sharp lid or just a sharp knife, cut out circles of the desired size from the dough. Place desired amount of filling on one half of the circle, brushing one edge with a small amount of water. Fold the circle in half, pinching to seal the pierogi. 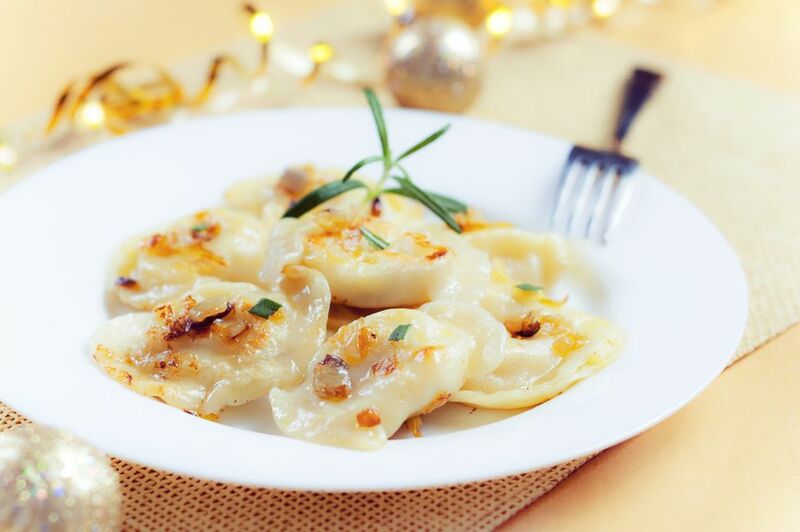 Repeat until all filling and dough is used, placing pierogi on a baking sheet or plate and covering until ready to boil. Add several pierogi at a time to the boiling water, making sure that they do not touch one another. Cook for several minutes until they float to the surface. Remove with a slotted spoon to individual plates, keeping covered while making the sauce. Make the sauce. In a heavy-bottomed skillet over medium-low heat, heat the ¼ cup olive oil and the 2 tablespoons flour, whisking constantly with a wire whisk to keep the flour from burning. When the flour begins to smell toasty, after about 1 to 2 minutes, add the remaining 2 cups soy milk and chopped scallions, stirring constantly. Cook until desired consistency, add the salt and generously pepper to taste. Pour sauce over pierogi and serve hot.